An Interview with Anja Foerster and Peter Kreuz, authors of "Different Thinking: Creative Strategies for Developing the Innovative Business"
Business unconventionality means beating the competition through imagination, inspiration and initiative. It means constantly looking for new ideas, smart strategies and new paths. It means constantly changing, taking risks with innovation. Mediocrity never wins. No matter how commonplace your company's products or services are, they must be embedded in a culture of continuous innovation. In Different Thinking co-authors Anja Foerster and Peter Kreuz discuss seventeen rules of business unconventionality that can help companies inject innovation and enthusiasm into the development of business strategies, markets, products and prices. Vern Burkhardt (VB): What is unconventional thinking? Anja Foerster: Unconventional thinking means to turn long-held industry conventions on their head, fearlessly challenge the old guard, and amaze customers with innovative and unique products and services. In every industry there are unwritten rules governing how business is done. For example, you get legal advice in a lawyer’s office and not at the airport or in a coffee bar. Unconventional thinking means that you're constantly asking "Why not? "—in order to uncover those industry orthodoxies. That is step one. Step two is to turn those seemingly irrefutable laws on their head. The interesting question is why are there dogmas and orthodoxies in every industry? Usually it's simply because that’s the way it’s always been done. It's as simple as this. Nobody dared to question the status quo and/or lacked the imagination to regard old problems from a new angle. And this is, in my opinion, a golden opportunity for innovation. Vern Burkhardt (VB): Would you give us an example? Anja Foerster: Take the American lawyers office turned coffee-shop Legal Grind in Los Angeles. Californians hankering for a cup of coffee and a good lawyer can get a caffeine fix at this full-service coffee bar that doubles as a legal referral and information centre. People with legal problems can meet with Bar-certified lawyers six days a week over java. Lawyer Jeffrey Hughes founded Legal Grind to make the legal profession more accessible to the public—at a price that is hard to beat. Twenty-five dollars gets you a legal consultation and a bottomless cup of coffee. Unconventional thinking at its best. VB: What holds people back from thinking unconventionally, especially given your advice that it’s a greater risk to be conventional than unconventional? Peter Kreuz: Maybe because it seems to be easier to preserve the status quo. Especially when things are running smoothly, there's always the danger of trying to perpetuate the old success formula, which might have been unconventional when it was invented years ago but has now become mainstream. And herein lies the danger. You start to think you know all the right answers. But this is never true because there are no right answers. If you deal with contemporary art, it’ll teach you very fast that there are many answers and some of them are wrong and right at the same time. Unconventional business thinkers understand one crucial lesson—they know that today's laurels are tomorrow's compost. VB: Is business unconventionality a prerequisite for survival in today's increasingly competitive business world? Anja Foerster: Yes, I believe it is. Incrementalism is no longer enough. The future belongs to those who are capable of thinking differently and who dare to take risks, to break old rules and make new ones. During the last few years, we have seen companies such as Ryanair, Starbucks, and Amazon.com become successful by changing the rules of the game. The uniqueness of those companies often rests with the soft and intangible aspects of the customer offerings rather than technology. VB: A business unconventionalist has courage and a vision. Would you talk about the importance of them also having passion and a determination to change things? Peter Kreuz: Passion and a determination to change things are essential characteristics of any business unconventionalist. Can you imagine Anita Roddick, Richard Branson, or Nicolas Hayek without loads of passion, courage and vision? In my opinion, your willingness to be a business unconventionalist is put to a test when you come up with an idea that is going against traditional industry logic. This is the moment, when self-proclaimed experts will tell you that this crazy idea will never work. Take Nicolas Hayek as an example. Plastic watches represented a truly revolutionary idea for the Swiss watchmakers and, of course, many rejected his idea. They told him his idea was totally crazy and would be the ruin of Swiss watch making. VB: The challenge is to not be overly influenced by conventional wisdom? Peter Kreuz: The real challenge, as any entrepreneur will confirm, is having the courage to stick to your idea when all the experts tell you that you've got it wrong. Reinventing your business model, capturing new markets and coming up with bold innovations requires, by definition, you to stray from the path of conventional wisdom. VB: All employees in a business must be encouraged to internalize a spirit of continual innovation, of unconventional thinking, of questioning the status quo. What do you mean when you say employees must continually look over the rim of their teacup everyday? Anja Foerster: In order to develop a truly innovative business, it is not enough to transgress the rules a tiny bit—we have to turn the rules on their head. We have to look beyond the borders of day-to-day business, regard old problems from a new angle and free ourselves from the stranglehold of the past. We have to turn our attention to other industries in order to overcome the limits of our perceptions. VB: Looking at other industries sparks our creative thinking? Anja Foerster: It allows us to discover as yet unexploited territories with potential for a true boost in value. This approach can work for any company and any employee. Let me give you an example. I have to admit that I had always assumed a government department would be the last place you would find unconventional thinking. However, the example of the German customs authorities shows just how wrong that assumption was. German customs were looking for new ways to dispose of the many articles they impounded or confiscated. In their search, they looked beyond the confines of their own industry to a completely different market—online auctions. More precisely, they found the inspiration for a new sales model in the activities of the online auction house eBay. Using the Internet address www.zoll-auktion.de, almost 200 government agencies now auction off everything that is confiscated in the name of the state—cars, carpets, computers, electronic devices of all kinds, watches, clocks, and even angling equipment. VB: Are more and more business owners and employees in Germany, where you live, becoming unconventional in their thinking? Peter Kreuz: I think Germany is no different from many other countries. There are some very unconventional business thinkers, but they are a minority. It is our goal to change this. Companies will no longer dominate their markets by playing it safe but rather by playing it smart. It's all about defying conventional wisdom and building great organizations by bringing out the best in everyone. And the most direct way to fill a company with smart ideas on how to fight commoditization and to find unconventional avenues for growth is to fill it with great people and to open it for outside thinking. VB: You have written a number of books in German. Will you be publishing any books in English in the future? Peter Kreuz: Anything But Ordinary is currently being translated and will be published in English by Cyan Books in 2009. VB: We will look forward to its release. In order to succeed in an increasingly competitive world, individuals and businesses alike need to come up with new takes on old business models, fight commoditization and find unconventional avenues for growth. The only way to achieve true differentiation and unique status is to do something completely different. Anja Foerster and Peter Kreuz represent a new generation of European-based management thinkers. Their mission is to help organizations identify growth opportunities and game-changing strategies. They are keynote speakers, management consultants, and authors of a number of books written in German. Different Thinking: Creative Strategies for Developing the Innovative Business and Anything But Ordinary won the Business Book Award in 2007. 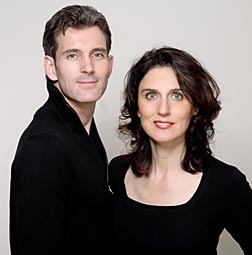 Before starting their own company, Anja was a manager at Accenture and Peter was an assistant professor at the Vienna University of Economics and Business Administration. Anja and Peter are married and live in Germany and France and travel throughout the world in search of unusual business ideas.